There is a tradition that when presidents leave the White House, they fade into the background. But these are not traditional times in America and former president Barack Obama is a young former president who left office popular. He also left his political party without an heir apparent, meaning he’s the fallback? In small, but visible ways Obama is still very relevant. He traveled to Europe at the same time as President Trump who there as part of his first foreign trip as president. He then continued his bromance with Canadian prime minister Justin Trudeau earlier this month when the two met for a meal in Montreal, the pictures quickly exploding on social media. And then there’s his latest: On Thursday he took to Facebook to write a detailed defence of the Affordable Care Act. Hours later, he agreed to his first post-presidency campaign event -- likely a rally for the Democratic candidate for Virginia governor, with no date yet set. Obama probably didn’t plan for his presidential afterlife to be like this. He might have looked the polls last fall, as most did, and assumed that Hillary Clinton would win. If that had happened, he likely would have instead focused on writing his memoirs, setting up his presidential library, and a giving a few paid speeches around the world. But, of course, Clinton did not win and the current president has something of a fixation on tearing down Obama’s legacy. This is particularly true when it comes to issues of immigration, health care, the Iran nuclear deal and on the environment. Compound that with the fact that Donald Trump has had consistently low approval ratings and the Democratic Party is in ruins without any sign of a comeback. Obama, by contrast, left office with the highest approval ratings of any outgoing president since Ronald Reagan. He’s the Democrats best -- and perhaps only -- effective voice right now. In the past, the party might have pushed a former president to lie low so as to give the next generation the spotlight. Not this time. Of course Obama is not the only one from the last administration still in the mix. Joe Biden has been touring the country, speaking at political events. Even former attorney general Eric Holder was the keynote speaker at a Virginia Democratic party fundraiser last week. Others aren’t complaining that Obama is still around. Trump repeatedly brings up the former president on Twitter as a foil. Democrats, still mired in the harsh feelings of the Clinton/Sanders 2016 Democratic primary, seem to find a rare bit of common ground on the fact they like him. 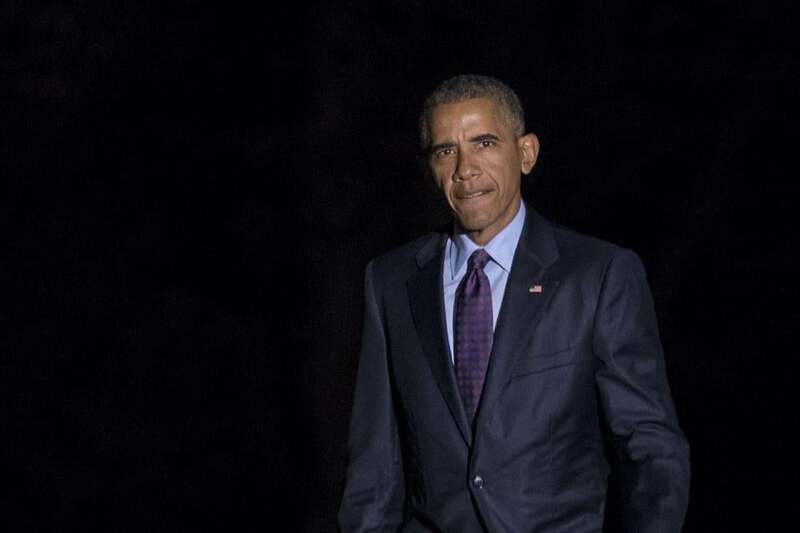 Just how much more time Obama spends under the lights is really up to him. In political retirement he can choose which battles he wants to fight. Though if Obama enjoys it, he might usher in a new model for former presidents. Can you imagine what a Trump post-presidency would look like?